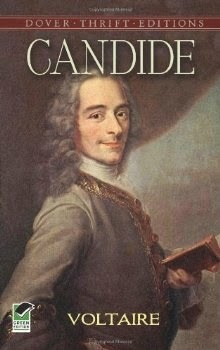 From Goodreads: Brought up in the household of a powerful Baron, Candide is an open-minded young man, whose tutor, Pangloss, has instilled in him the belief that 'all is for the best'. But when his love for the Baron's rosy-cheeked daughter is discovered, Candide is cast out to make his own way in the world. Cunegonde (whose name I pronounced in my head at least a dozen different ways, none, I'm sure, correct!) gives the story ongoing motivation. Rather unsettling though was the very matter of fact, off hand way Voltaire often described rather horrific events such as wars, rapes and general mistreatment of others. At only 94 pages, Candide is not at all daunting and well worth the read.